Resurrection, book 9 of the Unseen Things series is now available! I am very happy to announce that book 9 of the Unseen Things series is now available! Synopsis: When Logan’s body was removed from its grave, they thought it was just the work some a cult, or a deranged individual. Never in a million years would they have dreamed that Derek’s brother had been taken for a very specific reason, nor could they have possibly guessed what that reason might be. Nebraska; but I now live in Arlington, Texas. 1980’s I took a course from the Institute of Children’s Literature. They encouraged me to continue writing. move their operations to Mars. Colorado. I had this published by a pay-on-demand publishing company. a traditional publisher interesting in publishing. I’m afraid I don’t know how to market them successfully. review, and how do you handle it? : I’ve had few reviews and none were particularly harsh. like to write young adult novels the best. Damon Runyon, Ian Fleming, and Tom Clancy. not writing? : Watching television and walking the dog. Microsoft Word is easy to use. kind of book you liked to read as a youth. currently available as ebooks at Amazon.com. The first draft of Resurrection is complete! 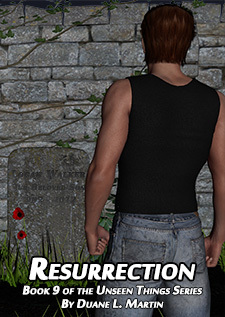 I just finished writing book 9 of the series, Resurrection. I’ll start the proofreading tonight, and it all goes we’ll I’ll have it published by next Monday at the latest. This book was sort of an emotional roller coaster, but the last two chapters are quite a lot of fun, so at least it ends on a high note. It also ends exactly where the next book is going to begin. co-writer. We are from Stillmore Georgia. and let other people read them. to get even better with it. these formats do you prefer and why? : Our books are available in ebook and and hard copies. of our marketing is done through social media and blogging. enjoys Star Wars books and authors like John Flanagan. deleted by accident and no writer wants that. out there so people can see what you have to offer. J. Alton Mast from Bethlehem, PA.
more capable hands then myself. or Ipad it just doesn’t feel right. I see a negative or unfavorable review, I brush it off of my shoulder. down. I choose not to take it personally and keep moving forward. and use the advice to better my skills. me, but one of his series did inspire me to write. familiar to me since I was young. an old curmudgeon who’s stuck in her ways. doing what you love to do. So as I’ve stated many times before, I rarely pre-plan anything in my books other than the most general ideas. All the rest I just type and let the story flow out of me in whatever way it feels like it should, just as though I were standing there watching the scenes in real life while I typed it all out. Even the simplest little notion can turn into something that affects the whole series, like the notion I had today. I’m currently working on chapter 14 of Resurrection and there was a part that came up that had nothing to do really with what I ended up doing, but it led to it, and what I did felt so natural when I did it. It was something I’d sort of hinted at a bit in the past but never really out and out said, nor had I had any plans at all to say it in this or any other book, but in this one particular moment, it felt right to finally say it, and now that one little thing is turning into a major part of the story. Not only that, but it’ll bring someone who heretofore was sort of a secondary character and will elevate her up to main character status along with the others. I’m not going to say what this all involves because that would ruin it, but let’s just say that I’m really excited about what I’m doing with it. Resurrection has been a difficult book for me to write. It just hasn’t been flowing as well as the others for one main reason…it’s kinda depressing. Now don’t get me wrong, there are some really fun scenes in this book, but there’s also a lot of heavy emotional and relationship stuff that was done out of necessity. You can’t just bring people back from the dead without there being some regrets, resentments and other emotional issues that go along with that. The problem with that sort of thing is that it’s a bummer to have to write it. The fun stuff is a blast and I can blow through those scenes in no time at all, but the heavy stuff…that takes a lot more thought and you really have to become each of the characters so you can really understand their point of view and why they feel the way they do. Now, that said, aside from the fun stuff and the heavy drama, there are also a lot of firsts in this book. 1. You’ll go to Charles and Richard’s house for the first time. 2. You’ll meet the Ach’len for the first time. 3. The main characters all discover and develop a new remote linking ability that allows them to do some really cool (and fun) stuff. 4. One of the characters reveals a secret that becomes a major part of the story. 5. That part of the story is sort of an offshoot of something they were already doing, but they’re going for a completely different result. 6. You’ll find out a bit about how just how tough the reptilians are. 7. You’ll find out the details of what happened the night Logan committed suicide. There’s probably more I’m forgetting to mention, but there are some major story advancements in this book. If I keep up with my chapter a day goal, the book will be finished by Friday at the latest, and then it’ll take me three or four days to proofread it and get it ready for publication. I’m hoping to have it out by next Wednesday or so. That’s it for now. Time to get back to writing.